Share the post "Interesting Facts And Uses Of Marigolds Or Calendula"
Calendula is a genus of about 15–20 species of annual and perennial herbaceous plants in the daisy family Asteraceae. They are native to southwestern Asia, western Europe, Macaronesia, and the Mediterranean. The most commonly cultivated and used member of the genus is Calendula officinalis, also known as pot marigold, ruddles, common marigold, garden marigold, English marigold, or Scottish marigold. Popular herbal and cosmetic products named ‘calendula’ invariably derive from C. officinalis. With its bright yellow-orange hues and cheerful nature, it’s no wonder the pot marigold is a summertime favourite with gardeners! Calendula officinalis is widely cultivated and can be grown easily in sunny locations in most kinds of soils. Although perennial, it is commonly treated as an annual, particularly in colder regions where its winter survival is poor and in hot summer locations where it also does not survive. These bright and vibrant flowers will liven up any garden, patio and other outdoor spaces. They would be ideal in beds, as borders, and in container gardening. 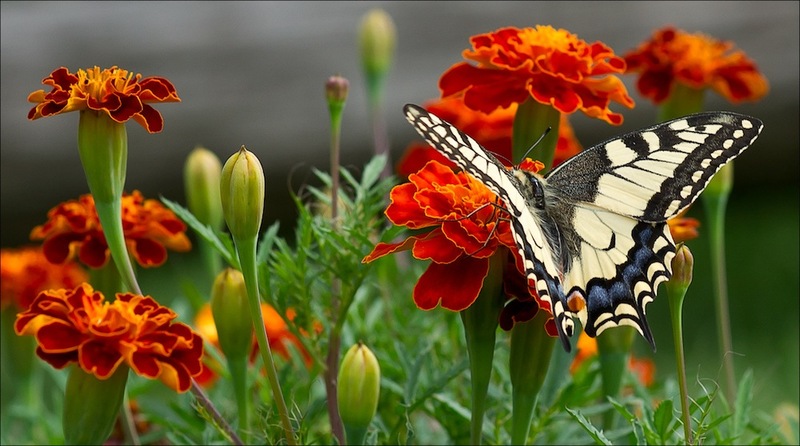 Pot marigolds are also known to attract butterflies to the garden. Calendulas are considered by many gardening experts as among the easiest and most versatile flowers to grow in a garden, especially because they tolerate most soils. • The name calendula is a modern Latin diminutive of calendae, meaning “little calendar”, “little clock” or possibly “little weather-glass”. • The common name “marigold” refers to the Virgin Mary. • One medieval author named Macer described marigold in his volume on herbs and thought that merely to look upon the blooms would improve eyesight and draw evil “humors” from the head. The only downside is that marigolds produce a strong, pungent scent that sometimes it isn’t so pleasant. Regardless, marigolds are grown commercially in various parts of the world for many different uses. • Pot marigold (calendula), also called “Poor Man’s Saffron,” is edible. The flowers can be used as a substitute for the more expensive saffron. Add to soups, stews, and salads. The flowers were a common ingredient in German soups and stews, which explains the nickname “pot marigold”. • They can be also a food for livestock. Marigolds is often added to chicken fodder to increase the yellowness of the egg yolks. • Pot marigold is often used as a natural dye for foods, such as cheese, pasta, vegetable oil, margarine, mayonnaise, mustard and more. A calendula rinse will color Easter eggs and tint ricean attractive yellow. • The pungent scent of the marigold will deter insects and pests from the garden. They are often used as companion plants for tomatoes, eggplant, potatoes and chili peppers. • The pungent scent is also known to repel mosquitoes. Plant marigolds near entrances and windows to keep mosquitoes away. • In India and Nepal, where the flowers hold significant meaning, marigolds are typically used to make floral garlands for festivals, weddings, celebrations, and religious events. Calendula flowers have been used to decorate the statues of Hindu deities since early times. • Romans and Greeks used the golden calendula in many rituals and ceremonies, sometimes wearing crowns or garlands made from the flowers. One of its nicknames is “Mary’s Gold,” referring to the flowers’ use in early Catholic events in some countries. • Marigolds is an ingredient in some perfumes. • Marigolds make excellent, long lasting cut flowers. Marigold has been highly valued by herbal healers of centuries. Only the flower heads of marigolds are used medicinally. • The flowers can be used to make a herbal tea that can help alleviate sore throats, cramps and fevers. • Marigold is known to be effective against painful mouth and stomach ulcers as well as colitis, candida and gastritis with its anti-bacterial/anti-fungal actions. Marigolds are effective in this aspect because they tend to stimulate the lymphatic system and thereby minimize the swelling as well as cleanse the body of toxins which may be contributing to the ulcers. • Calendula has been used traditionally for abdominal cramps and constipation. The extract of C. officinalis flowers was shown to have both spasmolytic and spasmogenic effects. • Is a safe diuretic that will aid in detoxifying the urinary tract. • One of the medicinal uses of marigolds is that it promotes the growth of both new blood vessels as well as new skin tissue and hence it is used in the healing of wounds such as burns, scrapes as well as irritated skin. • Marigold flowers is that it is very beneficial in getting rid of an oily complexion naturally. In this treatment, fresh flowers need to be soaked in warm water and then applied to the skin at least once a day and allowed to remain for 10 minutes before washing it off. 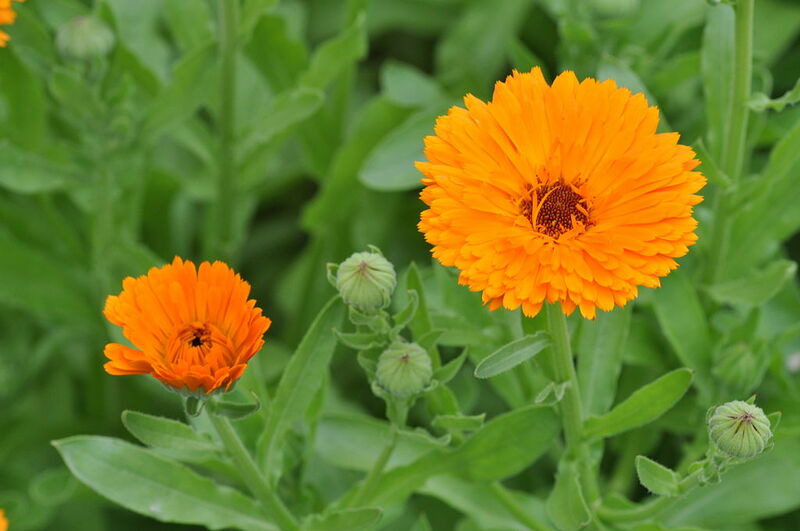 • Marigold has been used in traditional herbal medicine to treat headaches and toothaches. • It balances female reproductive systems with its estrogenic effect—for example in cases of painful or scanty menstruation. A word of cauton: Calendula plants are known to cause allergic reactions, medication interactions and even adverse hormonal effects, also should be avoided during pregnancy. In the case of marigold, pot marigold (Calendula), a native to Europe, and French marigold (Tagetes), an American native in the same family as the daisy, are very different plants. Tagetes is a genus of annual and perennial, mostly herbaceous plants in the sunflower family (Asteraceae or Compositae). Tagetes minuta is the source of commercial “Tagetes oil” used in industry. It is now a naturalized species in Africa, Hawaii, and Australia, and is considered an invasive species (weed) in some regions. The most commonly cultivated varieties of Tagetes are known variously as African marigolds (usually referring to cultivars and hybrids of Tagetes erecta, although this species is not native to Africa), or French marigolds (usually referring to hybrids and cultivars of Tagetes patula, many of which were developed in France, although the species is not native to that country). In Ukraine, chornobryvtsi (T. erecta, T. patula, and the signet marigold, T. tenuifolia) are regarded as one of the national symbols, and are often mentioned in songs, poems, and tales. – Tagetes lucida, known as pericón, is used to prepare a sweetish, anise-flavored medicinal tea in Mexico. It is also used as a culinary herb in many warm climates, as a substitute for tarragon, and offered in the nursery as “Texas tarragon” or “Mexican mint marigold”. – Tagetes minuta, native to southern South America, is a tall, upright marigold plant with small flowers used as a culinary herb in Peru, Ecuador, and parts of Chile and Bolivia, where it is called by the Incan term huacatay. The paste is used to make the popular potato dish called ocopa. Having both “green” and “yellow/orange” notes, the taste and odor of fresh T. minuta is like a mixture of sweet basil, tarragon, mint and citrus. It is also used as a medicinal tea in some areas. Calendula is also a common herbal remedy used in skin preparations (among other uses). French marigold is a nice companion plant in the garden, makes an effective bug spray and looks lovely in a border. It doesn’t have the herbal range of calendula. Depending on the cultivars involved, both pot marigold and French marigold can look pretty similar. If you’re filling a flat with spring flowers at your local nursery and come upon a display of wonderful plants marked “MARIGOLDS,” you’re probably looking at French marigolds (Tagetes). They’re very popular annuals in gardens across the country. They aren’t fussy and bloom throughout the summer months. There are also many French marigold cultivars that can look like anything from intricate lemon yellow puff balls to russet daisies. Your best bet if you’re looking for pot marigold is to search for it by its scientific name, Calendula Officinalis. In all likelihood, if your nursery carries it, you’ll find it in a small display of herbal or specialty plants. As well as Calendula, the African or French marigold is very significant in Nepalese culture, where marigold garlands are used almost in every household, especially during the Tihar festival. It is always sold in the markets for daily worships and rituals. The marigold was regarded as the flower of the dead in pre-Hispanic Mexico, and is still widely used in the Day of the Dead celebrations. The marigold is also widely cultivated in India and Thailand, particularly the species T. erecta, T. patula, and T. tenuifolia. Vast quantities of marigolds are used in garlands and decoration for weddings, festivals, and religious events. 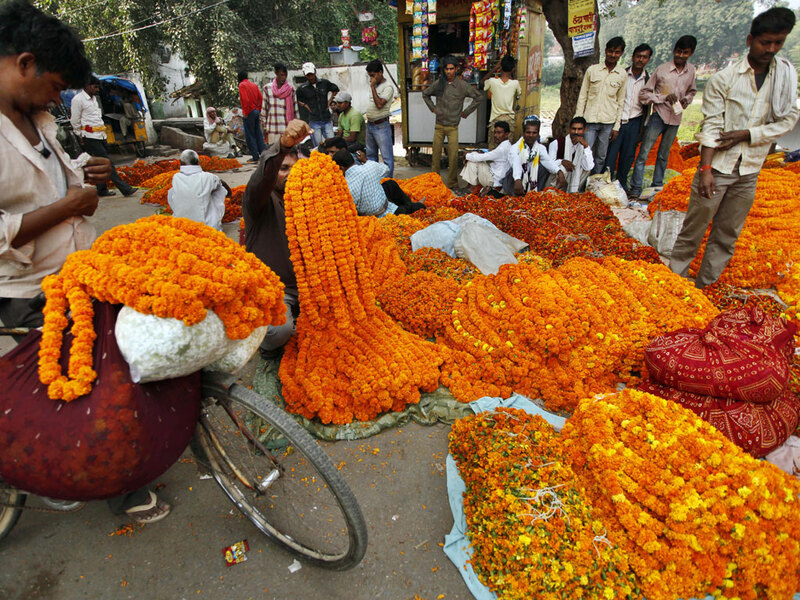 Marigold cultivation is extensively seen in Andhra Pradesh, Tamil Nadu, West Bengal, Karnataka, and Uttar Pradesh. In Ukraine, chornobryvtsi (T. erecta, T. patula, and the signet marigold, T. tenuifolia) are regarded as one of the national symbols, and are often mentioned in songs, poems, and tales. 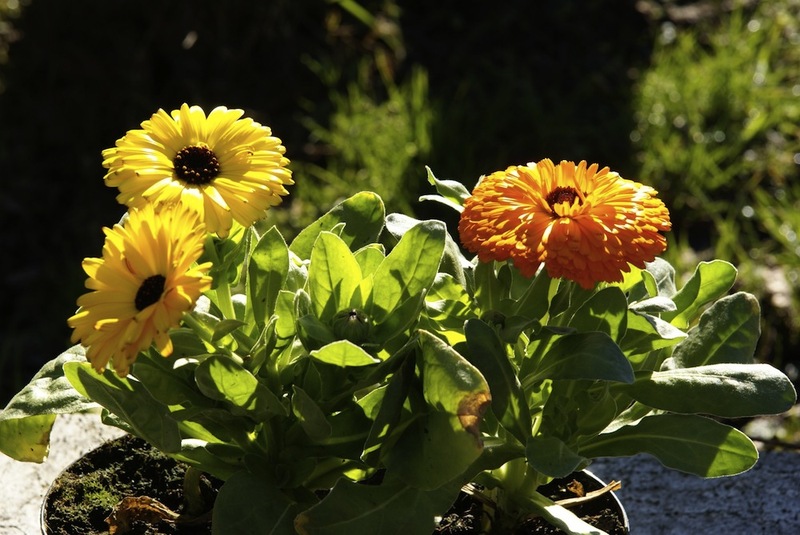 Do you grow Calendula (Marigolds) in your garden? What is your experience with this plant? Please share in the comments below! Do you sell Calendula (Marigolds) seeds or have plants for sale? You can place your advertisement here. Contact us now!